Make the most of your trip to Norfolk and explore its surrounding cities! Discover incredible events, culinary delights, history & more. Take a short ferry ride across the Elizabeth River and discover Olde Towne Portsmouth. Stroll down High Street, a tree-lined thoroughfare filled with antique shops and restaurants. Take the family to the Children’s Museum of Virginia. Jam out at the Portsmouth Pavillion, an outdoor concert venue. This historic seaport city has so much to offer. This beach town is known for more than just its sandy shores. Learn about marine life at the Virginia Aquarium, soar to new heights at iFly, enjoy a show at the Sandler Center and so much more! Be sure to check out Virginia Beach&apos;s waterfront dining options. Just minutes away from downtown, Chesapeake boasts 22 miles of waterways and plenty of outdoor fun! Take a kayak adventure through the Great Dismal Swamp and search for native animals at the Wildlife Refuge. Discover hidden paths along the trails at Northwest River Park and Campground. Chesapeake is filled with natural wonders! Williamsburg offers so much to be discovered. Travel back in time with a visit to Colonial Williamsburg. Feel the thrill of adventure at Busch Gardens Williamsburg and Water Country USA theme parks. Enjoy a glass of wine at Williamsburg Winery. Williamsburg offers fun for the entire family. The fun doesn&apos;t stop there! 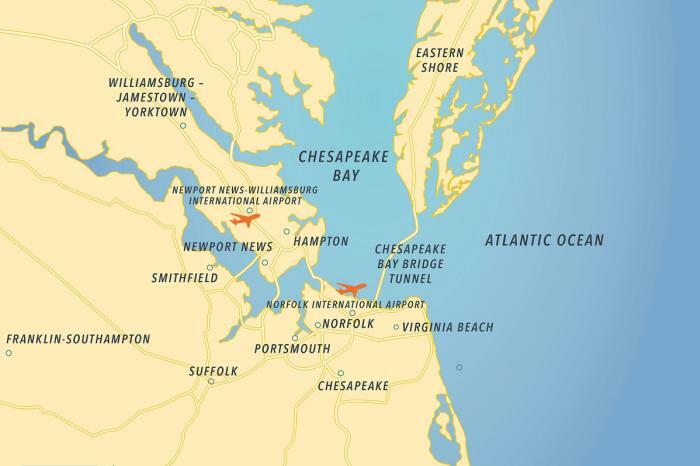 Check out these cities for an extended adventure: Smithfield, Suffolk, Hampton, Newport News and the Eastern Shore.